STOP THE CHILD ABUSE. Stop: NO THINKING! Stop: NO JUDGING! 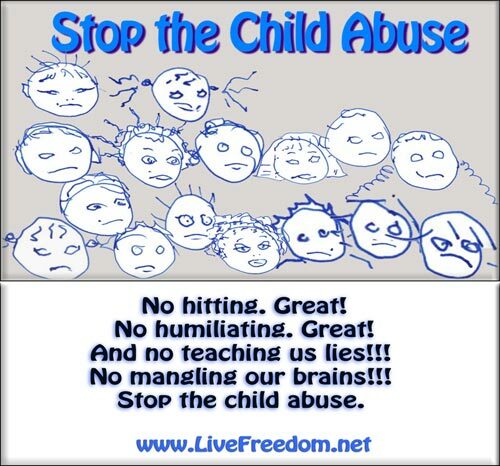 My message is simple: stop the child abuse. Teachers are systematically brain-damaging students, doing everything possible to shut down elementary thinking - and are doing this because it's what they're trained to do. Teachers are not allowed to hit students. Excellent. They're not supposed to be verbally abusive, or to ridicule students. Very good. Brain-damaging students is way worse. Students are taught to believe lies - like that all opinions are equal, something which is both illogical and counter-factual. It's easy to show that. They're also taught the lie that all cultures and religions are equal. There's another dangerous untruth students are taught, that it's wrong to judge. They may be told that Jesus said it was wrong to judge. However, to believe it's wrong to judge is to make a judgment - something that one may not do, if it's wrong to judge. Also if it's wrong to judge, then one must not judge if someone judges. Also anyone non-judgmental must believe that it is just as good to judge as not to judge. Why? To believe anything else is to be judgmental, and so one cannot judge that it's wrong to judge even though one has judged that it's wrong to judge. Does this sound like nonsense? Yes. It is nonsense, because it is nonsensical to hold that it's wrong to judge, and to start from that position leads to ever more nonsense. By the way, Jesus was not non-judgmental When he saw money changers in the temple, he threw them out - in other words, he judged this was wrong. And when Martha came and complained to him that Mary wasn't helping her but was sitting and listening to Jesus, Jesus said Mary did the better thing - in other words, once again he made a judgment Then there's his turning water into wine at a wedding, when the wine ran out. In other words, he judged it was good to have more wine at the wedding, and that it was good for him to turn water into wine. As for his famously saying that only a person without sin should judge the woman who was accused of adultery, once again he was judging: he was judging that only someone without sin should judge her. Instead, they're taught not even to try to figure out what is right or wrong. It's drilled into them there is no right or wrong. Everything is relative. Of course the people teaching these lies may be unaware that they are lies - just as teachers who taught that women, blacks, gays, Jews were inferior often believed these lies. Currently many teachers are almost certainly so brainwashed that they believe the current crop of popular lies. But some people in the hierarchy knew and know that these are lies - in other words, some people are deliberately pushing the teaching of lies. That's not my concern here. My message is simple: we need to stop the child abuse, the massive crippling of children's minds throughout the West. We can see the outcome: a generation of young adults, especially the so-called "well-educated" who tend to be immune to evidence, are instead politically correct - meaning both insisting on the greatness of being non-judgmental, and raging against anything they disagree with. It is so clearly utterly necessary to start developing children's minds and their capacity to think instead of crippling their minds. What is a possible first step? Get involved, if you aren't already - with local schools and school boards, by writing to newspapers, by posting online, by speaking to friends and in wider circles. Another possible step is to come to Live Freedom - http://LiveFreedom.net. A central goal is reaching children before they are utterly brainwashed, confronting and changing the education system so it again becomes an education system. I will end with a question I haven’t addressed: who could possibly be behind the brain-wrecking that's going on? The answer seems pretty evident with even a bit of searching. Here's one truth students are taught: that 6 million Jews were murdered in the Holocaust by the Nazis. Then, here's a truth students are NOT taught: that 270 MILLION non-Muslims were slaughtered by Muslims for being non-Muslim. Why isn't this simple truth taught as well? Why, instead, against all the evidence, are students are taught that Islam is a religion of peace"
I will leave it to you to decide why students learn the first truth and not the second. It is likely that at least part of the answer is that Germans do not threaten to harm anyone who teaches about the Holocaust, and that Germans do not claim it is hate speech to mention the Holocaust. On the other hand powerful Islamic lobbies do threaten people who speak out with the truth about Islamic history and ideology. But my concern here isn't about why we have the situation we have. I will end by repeating my message: we need to stop the child abuse, the massive crippling of children’s minds throughout the West. As for me, I've spent a lot of time and energy showing how the so-called education system is systematically teaching students not to think. I've written an ebook, Think or Sink. It's nice and friendly in tone, even as it documents the systematic taboo on much thinking in the West. I've spoken on Education not Indoctrination, the way the current education system in the West is actually an indoctrination system. Now I am saying, very simply, what is going on is child abuse on a massive level. STOP THE CHILD ABUSE. PS. 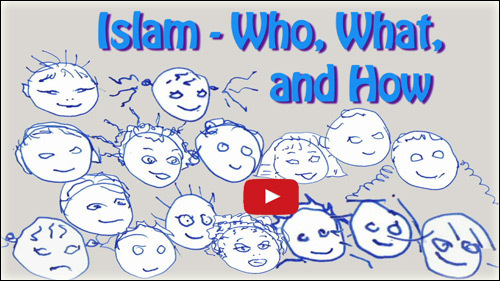 A useful tool for teaching one bit of truth: Islam - Who, What, and How, a 9-minute kids' video. Fun, simple, easy. And truthful. How far and wide will the video reach? Will it reach all kids in the West? Will we get education back into the schools? That's up to us.